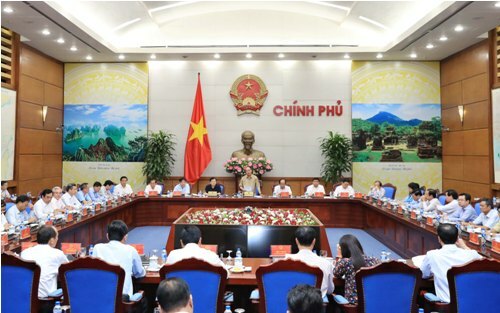 PM Nguyen Xuan Phuc on May 9 chaired a working session with leaders from provinces in the Mekong Delta on soil erosion situations, which tend to expand in both of scope and scale. PM Nguyen Xuan Phuc chairs a working session with leaders from provinces in the Mekong Delta on soil erosion situations, which tend to expand in both of scope and scale, Ha Noi, May 9, 2018. Deputy PM Trinh Dinh Dung, leaders from some ministries and agencies and 13 cities and provinces in the Mekong Delta joined the meeting. According to the report of the Ministry of Agriculture and Rural Development (MARD), there are 562 coastline sites with a total length of 786 km having soil erosion, including 42 sites with extreme erosion with a total length of 149 km (26 river banks with length of 65 km and 16 coastline areas with length of 84 km), requiring the total investment capital of around VND6,990 billion. The MARD is suggesting establishing a plan on investigating and evaluating status and proposing an overall solution to preventing soil erosion in coastline sites in the Mekong Delta, to ensure security for local people’s lives and regional infrastructure as well as limiting coastal erosion with the rate of 300 ha per year. Riverbank, canal and coastline erosions are directly threatening safety of residential areas, river and coastal infrastructures, particularly in such provinces as An Giang, Dong Thap, Ca Mau and Bac Lieu. Affirming the strategic location of the Mekong Delta, which is home to 20 million people, the PM stressed the need to mobilize all resources to tackle consequences caused by climate change in the Mekong Delta for guaranteeing people’s lives and assets. PM Phuc asked ministries and localities to synchronously and promptly launch measures to implement the Government Resolution No. 120 on sustainable development in the Mekong Delta in response to climate change. He highlighted the planning of residential areas, resettlement and production as well as enhancing international cooperation with other nations in the region to regulate flows, especially in the dry season. He decided to supplement money from the State budget reserve for localities from the Mekong Delta to construct crucial projects and from the Official Development Assistance (ODA) resource to set up a climate change adaption fund in the Mekong Delta and seek for other resources for the fund.